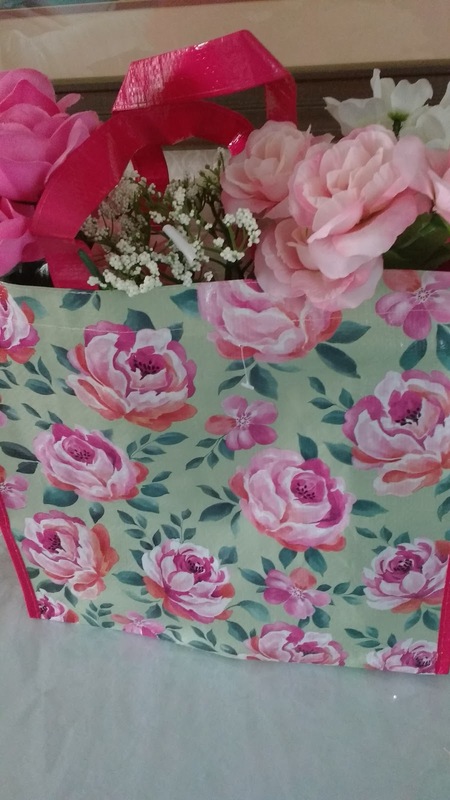 Today while I was out getting groceries I stopped at Dollar Tree for some dishwasher pellets ($1.00 for a bag of 10) and saw their new selection of vinyl bags for a dollar each.Sometimes there are such pretty prints on these things, and this one is bound in a vinyl bias tape type of trim. It looks so pretty on the kitchen table with the three bunches of flowers I also bought. Total cost for this "look" was $4.00. What do you do with these pretty bags? I will use this one on the door handle in the kitchen to collect the plastic bags from grocery stores, which are handy for the small trash containers in the bedrooms, bathrooms, and sewing room. I was tempted to get some more for friends, but it would cost more to mail them, so I'm giving you this heads up. You might find these at your Dollar Tree. And please let me know what you do with them. I like to get fabric like this, or an umbrella with a similar print, or any household thing because it is pretty, and I never know when the trend might revert to something that is not so pretty. 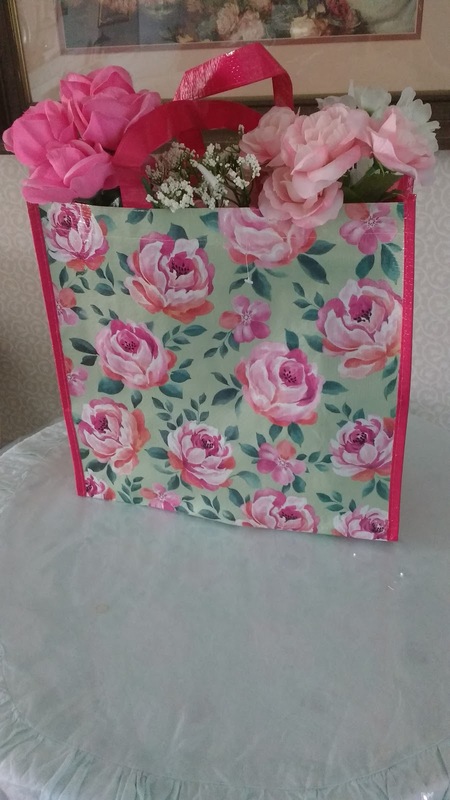 This could also be used as a gift bag for a birthday, wedding, or for a portable tea-time to a friend, with all the food they need and tea bags. I know someone who puts things like this in frames! Yes, this would look good framed. Also great for an ongoing sewing project when you want to tidy up and get things in the sewing room out of the way. Calling on someone who needs encouragement? Fill it with good things and take it to her door. I love the cheeriness of that bag. I've been using canvas bags for my groceries since the stores charge 10¢ for each plastic bag they give you. I also buy the kroger vinyl bags as well. I went to Michaels yesterday to get some small rings to extend my antique French bracelet. They weren't busy at all. They've moved their flowers so I saw a lot of nice blooms for 40% off. Will go back. A Hobby Lobby opened across the street from them and I'm sure a lot of Michael's customers will wander there. Wonderful ideas! I’m going to go check my local store. Something lovely to put all those bags in is a great idea! They are pretty! Sadly, I'm not talented with a needle. I tried to get into crochetting, but no matter how hard I tried I just could not master string tension. Also I'm just not as visually creative. I always admire the little projects you do. I remember one blog post you said you tried to do something creative everyday. Maybe I could at least try to draw a picture a day. I guess the trolls would hate me too! I love your blog style. I love classic art of women in pretty dresses, flowers, tea cups, and all things girly! Right now I'm not a homemaker, but I do help my parents around my house to the best of my ability. One day, I hope I might be able to be a housewife if that is what God has in store for me. Hm, I wonder if cooking counts as something creative? I do love to cook! Haha! Just post even MORE flowers and lace..that'll sort them out! ;) The bag is really lovely and at that price it would be hard to stop at just one. Thank you for bringing more beauty into our lives. This is lovely and a great idea. Guess I need to make a trip to Dollar Tree! These are indeed lovely, and I wish I could find them here in the U.K. I like the idea too, about filling them with some things to take to someone who needs cheering up. I can imagine including the fresh flowers, a tea bread, and perhaps an encouraging magazine or book. As regards the trolls, I hope you never let their unpleasantness discourage you, Lydia. You’ve been an inspiration to so many of us over the years and I thank you for all you do. Wow, I can't believe people would complain about seeing flowers and lace! I guess they are being forced to look at your blog! 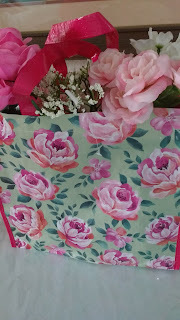 : ) That is a very pretty bag. I have a dollar tree close by so I will have to check it out. One thing that I have found there are a ten pack of those filmsy shower caps you get in hotels. I use those to cover large bowls instead of saran wrap, works great, especially for covering dough on the first rise. Just thought I would share that tip. 'Tis flowers and lace which maketh my heart palpitate!